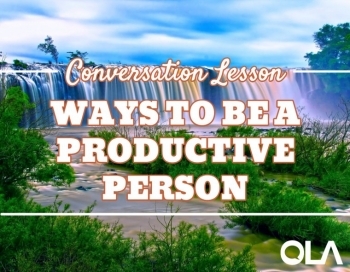 Advanced English Conversation Class on "Ways to be Productive"
Cada semana publicamos un eBook para usar en nuestras clases de conversación por Skype. Estos fantásticos eBooks permiten que nuestros alumnos aprendan y usen nuevo vocabulario para poder hablar de una gran variedad de temas interesantes y divertidos. En este vídeo, contesto a 3 preguntas del eBook sobre Maneras de ser una persona productiva. Hablo sobre lo que hago yo en el trabajo para trabajar de forma eficaz, y doy mi opinión sobre si un despacho ordenado te ayuda ser productivo y porqué tantas empresas buscan a empleados que sean buenos en multitarear. Para aprender más vocabulario, leer un articulo fascinante, ver más preguntas sobre el tema y hacer una trivia divertida, simplemente haz clic aquí y descarga el eBook – gratis. E.g. Batching helps me focus and work more productively. For example, it's much more beneficial for me to spend 30 minutes replying to emails three times a day, rather than constantly checking my email throughout the day. E.g. Doing everything at the same time would be chaos! E.g. If I have a tidy workspace I find it easier to focus on my work. E.g. A cluttered desk means a cluttered mind! E.g. Before a big day's work, I remove the clutter from my desk so I can go in to the office with a fresh and tidy mind! E.g. If you don't keep things tidy, the mess inevitably builds up! E.g. I like to get a good night's sleep to help me stay focused during my working day. E.g. The Pomodoro technique has been proven to increase productivity. E.g. Parkinson's Law states that "work expands so as to fill the time available for its completion". E.g. At the end of each pomodoro, you get 5 minutes relaxation time as a reward. E.g. If I don't get a good night's sleep I work slower and less productively the next day. E.g. Being tired and working less productively means I work later in the evening, and go to bed later, and wake up tired again.... it's a vicious circle!